This English muffin casserole is filled with sweet, tart cranberry sauce and creamy mascarpone cheese. Perfect for a holiday brunch! It’s funny how Christmas morning priorities shift as you get older. As a kid, I don’t even remember, nor do I think I cared what we ate, it was all about walking down the stairs to see the tree surrounded by presents and spend the whole morning opening each one in a euphoric frenzy. Food wasn’t even a thought in my mind. 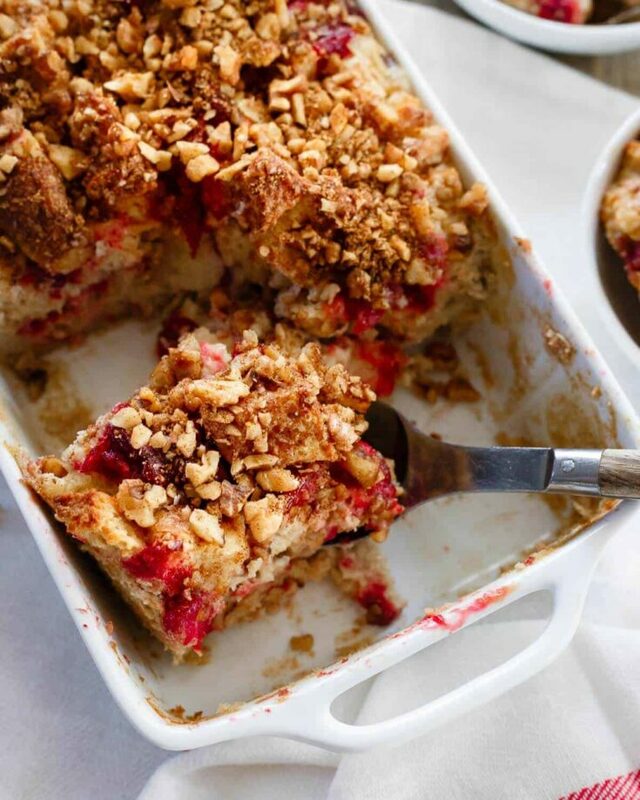 Watch the video of how to make this Cranberry Mascarpone English Muffin Casserole below! As an adult (with no kids), Christmas morning has completely shifted gears. If there’s 4 presents under the tree these days, that’s a lot. We wake up, immediately start the coffee, turn the Christmas tree lights on and settle into a lazy, relaxing and of course, decadent breakfast of some sort. My family has always had an imported box of Pandoro during the Christmas season. Some of us eat it Christmas Eve night, some for breakfast Christmas morning, others for Christmas dessert and a few (I might’ve fit in this category a few times) each and every one of those ocassions. Pandoro is a cake-like bread that has way more butter than I even want to think about in it. It’s similar to the more widely recognized Panettone just without the dried/candied fruits inside. You dust it with powdered sugar right before slicing and it’s one of the most delicious things that will ever touch your lips. Guaranteed. That said, it’s basically just bread and there’s always the need to eat something else for breakfast too. 1. Because adulthood unfortunately comes with that annoying little devil on your shoulder telling you to eat a more balanced meal and 2. Because if I didn’t, I’d be hungry again in approximately 23 minutes. 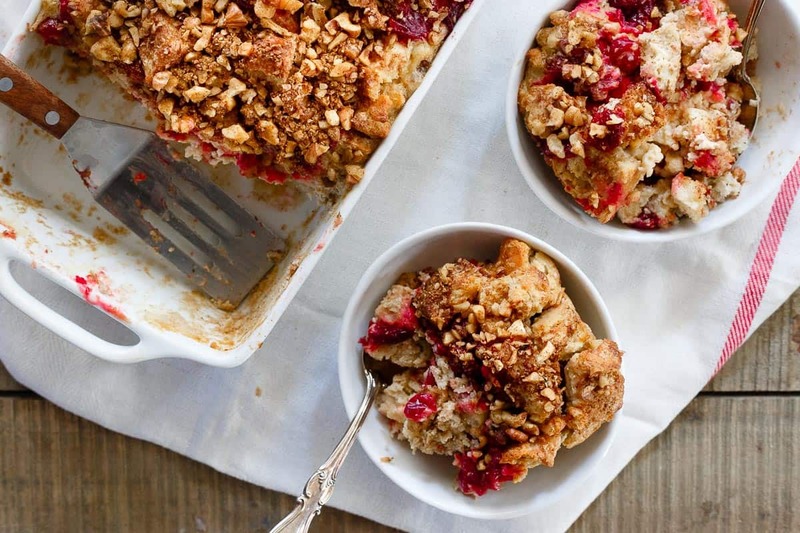 So, I’m considering other options this year for Christmas breakfast like this cranberry mascarpone english muffin casserole and maybe leaving the Pandoro for Christmas dessert instead. 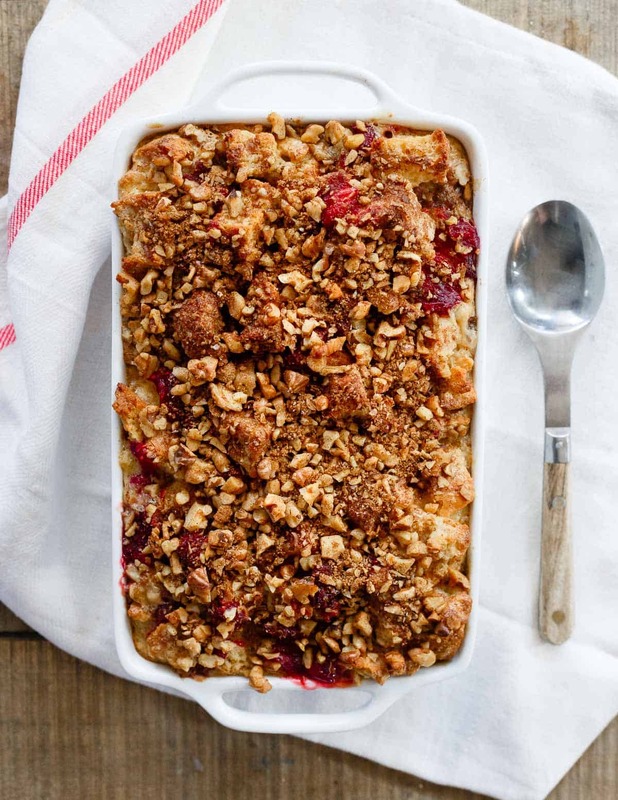 You could call this a “casserole” to make it feel breakfast appropriate but in reality, this is basically a tray of bread pudding. It’s more decadent than traditional bread pudding because of the deliciously creamy mascarpone and perfectly festive for the holiday with cranberry sauce (need an easy cranberry sauce recipe? Try this 5-ingredient slow cooker cranberry sauce) studded throughout. I used Udi’s Gluten Free white english muffins in it so anyone at your Christmas breakfast table can enjoy it. The Udi’s english muffins are a bit more thick and dense (in a good way!) compared to a traditional english muffin so they lend themselves perfectly to a casserole/bread pudding like this because all of that lovely egg, milk and mascarpone mixture gets soaked up so well. With each english muffin cube drenched in that cinnamon and nutmeg infused creamy mixture, every bite is an indulgent holiday treat that your Christmas morning breakfast table needs. With a pop of that bright tart/sweetness from the cranberries and the crunchy cinnamon sugar walnut topping, it’s a pretty close rival to Pandoro in my book! 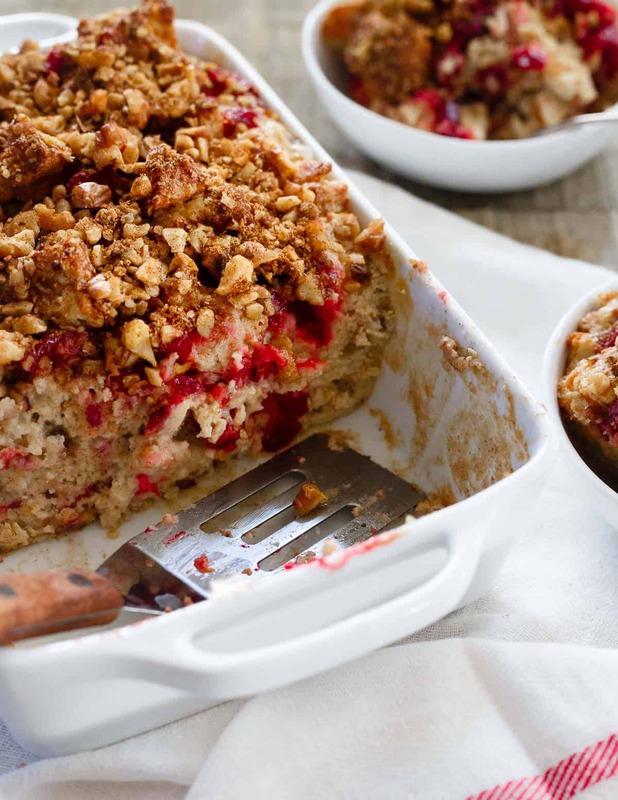 Love this Cranberry Mascarpone English Muffin Casserole recipe? Try other delicious breakfast recipes like: Everything Bagel Breakfast Strata, Chicken Sausage Breakfast Tostadas, and Mini Ham Cheese and Spinach Breakfast Pies. Cut english muffins into 1/2 inch or so cubes, lay flat on a baking sheet and toast until crispy, about 10 minutes tossing once halfway. Meanwhile, combine eggs, mascarpone, milk, cinnamon, nutmeg, salt and vanilla in a large bowl. Whisk until mixed together. Add the toasted english muffin cubes to the bowl and toss until all the cubes are fully coated in the mixture. Set aside and let soak for 10 minutes. Pour half the mixture into a baking dish. Dollop half the cranberry sauce over top of the mixture. Pour the remaining mixture on top, pushing evenly into the corners of the baking dish. Place remaining cranberry sauce evenly on top. Make the topping by combining all ingredients in a small bowl. Sprinkle all over the top of the casserole. Bake for about 30 minutes until set in the middle and edges start to turn golden brown. Let rest a few minutes before serving. *If you don't have leftover cranberry sauce make your own by combining 8 ounces fresh/frozen cranberries, 1/2 cup fresh orange juice and 2 tablespoons coconut or brown sugar in a sauce pot over medium heat. Cook down until berries thicken into a sauce. all these flavors… i’m drooling and so want to be at your house to devour this. Mascarpone? YES!! Love that you used English muffins here! Great idea! Love creations like this that I can eat all day long! Mmmm love the flavors and colors in this one! So pretty for Christmas morning! Great idea to use english muffins! Perfect for Christmas brunch! Love it! Can’t wait to get the ingredients together and make it! What’s the best size dish to use for this? Seems a 9×13 would be too big? An 8×8 or something similar would be best.